Ever since US Airways merged with America West, the travel industry has [% 2509701 | | buzzed %] with talk of the next big deal. None of the major airlines were left out, but it seems two were thrown around more than any others: Delta and Northwest. Now, after countless months of guesswork, it looks like we finally have some substance, and a merger between Delta and Northwest may be transitioning from rumor to reality. The pilot union at Northwest received detailed plans for a merged airline, and is currently discussing the practicalities of combining carriers. Whether or not the merger goes down likely depends on the success of these talks, and lengthy debate among members and between unions could prolong or kill the process. Still, the fact that merger plans have progressed to this stage shows the airlines are serious, and more importantly, suggests they are close to a deal. So what happens if a merger takes place? From a consumer standpoint, the air travel landscape would change dramatically, perhaps taking a grim turn. The combined airline would quickly look to cut costs by eliminating redundant routes and hubs, thus consolidating passenger traffic and creating higher demand for the routes the carrier does fly. What would come next is difficult to say. Higher fares are certainly possible, especially where Delta and Northwest formerly competed. On the customer service side, the US Airways-America West merger will hopefully serve as an example of what Delta and Northwest should [% 2509740 | | avoid %], if possible. Following that merger, customers suffered through frustrating ticketing systems, confusing check-in procedures, and an incredibly uneven flying experience. Delta and Northwest would do well to consider these pitfalls as they move through the planning process. Last, but not least, the U.S. would have a new number one carrier. A Delta-Northwest combination would surpass American in terms of capacity, probably by a fair margin. How this affects the industry is difficult to predict. Some analysts feel that mergers are and will continue to be necessary for the industry to remain healthy in the face of sky-high operating costs. Perhaps a merger between Delta and Northwest will be the first domino to fall in a series of mergers that will fundamentally change air travel as we know it. Continental and United? That possibility has been considered. And what about American? Will it be left in the dust, or will it look to combine as well? This is all speculation, of course. 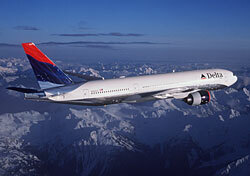 But with a Delta-Northwest merger finally on the horizon, we may not have to speculate much longer.